Join the 79% that got lucky! Bellagio is a certified 5 diamond hotel with spectacular views, entertainment, shopping with all the amenities. Caesars Palace pairs ancient Roman style with amazing fountains, statues and pools - built in 1966, the hotel has been a favorite of celebrities and high-rollers. Palazzo - the world's largest hotel- offers five-Diamond & AAA luxury and casino with modern ambiance. Features a 20,000 sq ft Lamborghini and exotic cars showroom. Planet Hollywood is a recent arrival in Vegas, with large resort and Casino with tons of shopping, dining, gambling and entertainment. Check out Siegfried and Roy white tiger habitat at the Mirage, along with other wildlife and flora exhibits. Venetian is an AAA & Five-diamond rated Resort and Casino, you'll find the Blue Man Group, nightclubs, and tons of shopping. Mandalay Bay is a beautiful hotel and casino. Careful, or you may end up hitched in the Mandalay Wedding Chapel. Paris offers fine dining with replicated landmarks including the Eiffel Tower and Arc de Triomphe. Wynn is a now-legendary Five Star and Five Diamond resort casino, absolute luxury, golf course. Bally's is well-known for their large rooms, quality service, and luxurious central location on the strip. Delano formally TheHotel is an expansion of Mandalay Bay, you'll find the popular MIX lounge and restaurant and lots of great entertainment. Encore is the Wynn's little sister... this newer resort features amazing decor and a Frank Sinatra-themed restaurant. Excalibur offers the chance to stay in a castle and dig the bright colors and medieval themes and entertainment. Kids under 11 stay free with an adult. The Flamingo has amazing pools, spa and atmosphere with a Wildlife Habitat featuring exotic birds. Hard Rock has many rooms with a view of the strip, you'll see rock memorabilia...and don't forget to eat at the Pink Taco. Not everywhere in Vegas offers the same odds to bag a room upgrade using the $20 dollar trick. Here’s how we rate the major Vegas casino hotels, with your percentage odds of a room upgrade, based on field reports from our Vegas Insiders. How to do the $20 Dollar Trick? 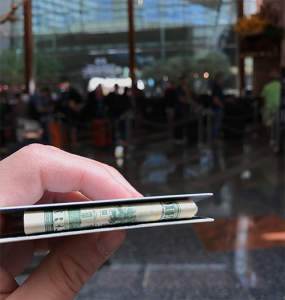 When checking into your Las Vegas hotel put $20 dollars between your credit card and ID and hand it over to the clerk on check-in. Ask the clerk whether they have any “complimentary upgrades” available. They will put the $20 dollars on top of their keyboard and try their best to get you an upgrade. Which can be an upgrade to a suite, resort fee waived, strip views and much much more! Does the $20 Trick Work in Vegas 2019? Be polite and hope for an upgrade! Front Desk Tip allows users like you to review what happened when they used the $20 dollar trick and what you were able to get (although at times, holiday weekends, there won’t be anything available and the clerk will return your $20). Getting ready for Las Vegas? We recommend you brush up on your gambling skills (and also gamble responsibly). You can play a free blackjack game with real Las Vegas blackjack rules. If you are traveling to Las Vegas, we recommend users use Uber & Lyft in Las Vegas. It’s a cheaper way to get around Las Vegas. Looking for a dayclub or nightlcub, the newest club is currently Kaos at the newly renovated Palms resort.